Pole Displays rise above their surroudings to command attention - And Spot Promotions' skilled creation and installation team ensures a good impression. We create pole displays that look beautiful, are easy to read, and are hung properly. Our attention to detail displays pride in your business and demonstrates your professionalism. Have a pole display? Spot's 40-foot boom truck can install pole displays! These elevated promotions are sometimes called lamp post flags, street pole banners, street banners, street light flags, or vertical banners. Whatever you call them, they are a great way to use existing infrastructure to elevate your message and make it visible. Want a pole banner? We produce custom pole displays. 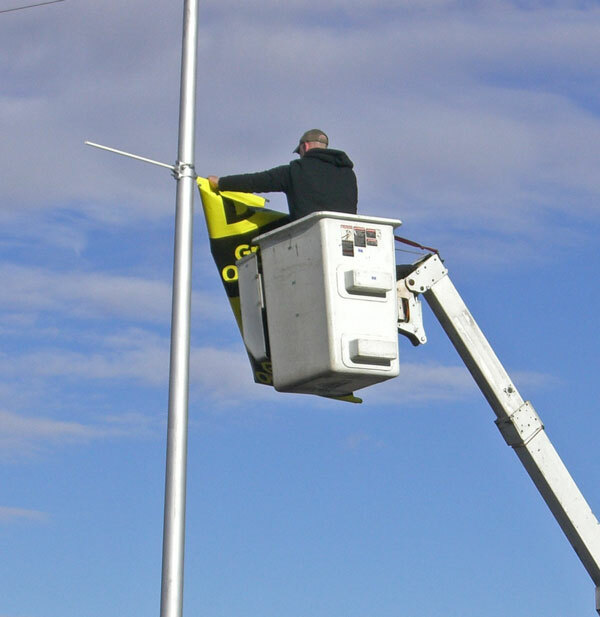 We can install street light advertising flags. If your business has light poles in your parking lot, why not turn them into eye-catching advertisements, adorned with vertical banners? 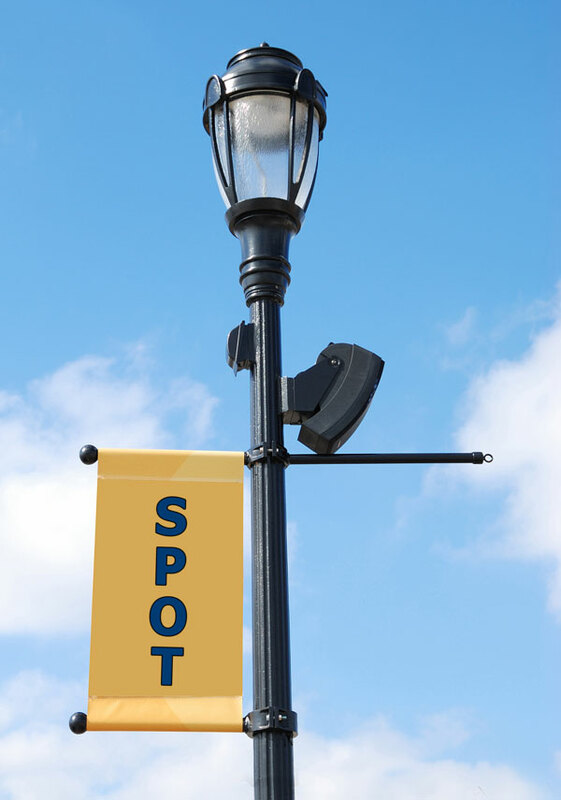 Municipalities can benefit from light pole advertising as well, using them to promote upcoming events, holiday or seasonal themes, public service reminders, etc. Mall or shopping centers can use lamp post flags to promote a new tennant, or rotate the advertisements among existing tennants to promote awareness, reward contract renewals, etc. We'd love to hear your creative ideas on pole display design and make them into reality. If you can dream it, we can build it. If you can't dream it, we'll dream it for you! Or, we can stick to the tried and true banners with "sale" or "grand opening" or similar promotional messages. Call us at (303) 320-4400 or email us for details.